Marchez quatre minutes pour l'ascenseur flocon de neige pour commencer votre journée sur la montagne et du ski à la porte quand il est temps d'aller en! Ce condo entièrement rénové au Double Eagle est parfaitement situé, à droite sur la route de bus gratuit, et à distance de marche des restaurants, boutiques et discothèques de la rue Main. Nouvelle peinture et moquette en mai 2018. La chambre familiale dispose d'une cheminée de gaz pour les nuits confortables, ainsi que la télévision haute définition et le câble, lecteurs Blu-ray et CD, et des jeux divers. Le condo a une très invitant, plan d'étage ouvert avec un grand espace de vie et cuisine ouverte. Les deux chambres sont sur les extrémités opposées de la copropriété, chacun avec sa propre salle de bains. La chambre principale dispose d'un lit queen (et d'une télévision haute définition), la deuxième chambre a un lit plein / superposés (et d'un lecteur TV / DVD), et la salle familiale a un nouveau canapé gigogne queen. Le cadre est très privé, avec le balcon donnant sur Sawmill Creek et Four O'Clock Ski Run. Double Eagle a un bain à remous sur place et a accès à la piscine Upper Village piscine et le jacuzzi. Vous êtes sûr de vous détendre et de profiter de votre séjour dans notre condo confortable! Notre emplacement central signifie que vous n'avez pas besoin d'une voiture! Contactez-nous pour plus d'informations sur les options pour voyager au départ de DIA et en ville. First of all, a big thank you to our wonderful hosts, Elizabeth and Harry!! We arrived in Breckenridge in the middle of a snow blizzard, and they offered us to check in before the 4 pm check in time. It was very nice of them to let us do that. We really appreciated their gesture! The condo is very cozy, comfortable and very well equipped, with everything we needed for our stay. There were plenty of towels in the bathrooms and some toiletries. The kitchen pantry had salt, spices, olive oil , tea, coffee , sugar, and a few other non perishables , so we didn't need to buy them for our short four day stay. They also have board games and movies available. Everything was very clean . The views from the balcony are fantastic. The hosts also left us their discount card for City Market Supermarket (greatly appreciated!) and a couple of shopping bags. Location is great , too; the condo is located on Four O'Clock Road, only a few blocks to the nearest lift and at the end of a ski day, you can ski right to the condo. It is also a few blocks away from the town's beautiful Main Street, where you can find a big variety of restaurants and shops. We wouldn't hesitate to rent this condo again! Well appointed and great location! Our family had a great stay over Spring Break at this VERY well appointed, conveniently situated 2BR/2BA condo on Four O'Clock Run. Just one block from the Snowflake lift and TRUE Ski-in off of Four O'Clock, it was also just up from Christy's Sports and City Market grocery. Inside, the updated decor was matched by thoughtful appointments of toiletries, linens, kitchenware, pantry stock and even 4 sets of crampons for guests!! Elizabeth and Harry were thoughtful and accessible hosts. Would definitely recommend... 4 out of 5 stars for rowdy neighbors whose smoke was oppressive at times. Cozy condo lives up to its name. After spending a day on the slopes (only a short walk to lifts) skiing right into our warm little condo was the perfect ending to a perfect day. Shopping and dinner is a (less than 10 min) scenic walk into town. Ending the night with a family movie in front of the fireplace made it a vacation to remember. First visit to Breck in the winter for us and this condo was perfect for our family of 4. Had everything we needed. It's in a fantastic location, a short walk up the street to the Snowflake lift at the start of the day and you can take 4 O'clock directly back to the condo at the end of the day. Christy Sports and Charter Sports are close by for ski rentals and tuning. It's a short walk down the street to downtown, so all the amenities of downtown Breck are ~5 minutes away. Hot tub was hot. Beds were comfortable. Elizabeth was super easy to work with and reached out a couple of times during our stay to make sure we had everything we needed. 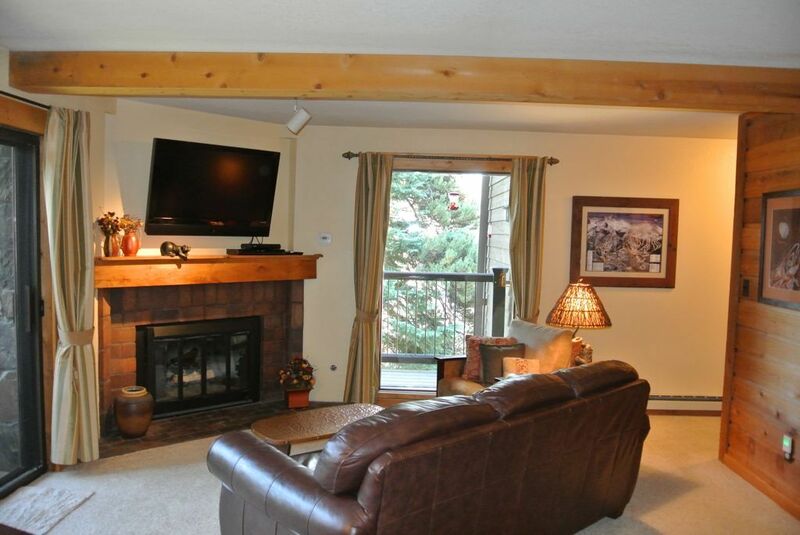 Perfect Condo for a Long Weekend at Breck! The Cozy Condo was fantastic for our stay. Easy to pick up prepaid lift tickets at the Snowflake Lift and ticket window. Plus Four O'clock Run all the way from Peak 8 to the condo is a great way to wrap up a day on the slopes. Plus, it is a really easy walk into town to go to Relish or The Canteen - two great restaurants in Breckenridge. There were lots of cards and games for my teenagers and all the amenities were top notch. Truly a wonderful property which I hope to use again soon. Beautiful condo! Perfect location close to town. The condo is in a perfect location close to town. We had everything we could possibly need. The kitchen is well stocked. The beds were comfortable. Love how all the manuals were in one place. This is the first time we have used a convection oven. We made an overnight French toast for Christmas morning that came out perfect. Thank you Elizabeth and Harry for putting up a Christmas tree for our kids. The had a wonderful Christmas vacation!